B3 C3 P3 REVISION QUIZ!. 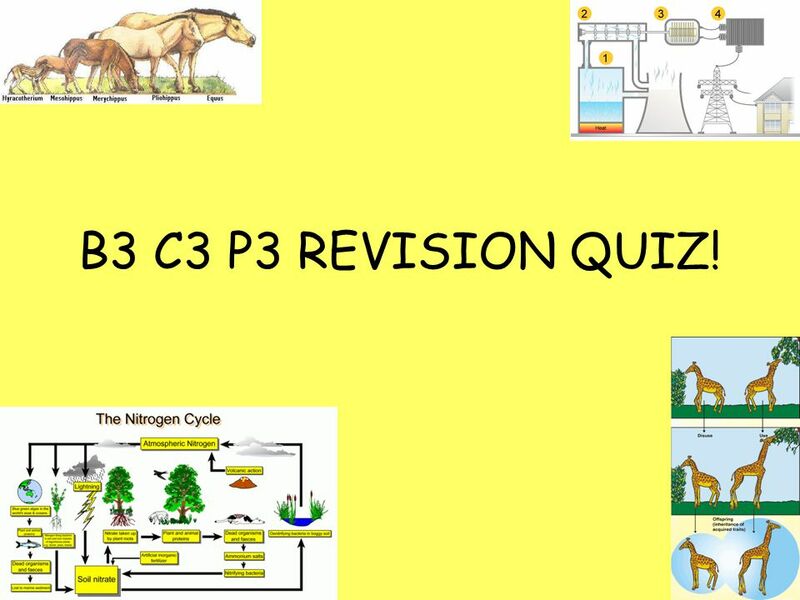 1 B3 C3 P3 REVISION QUIZ! 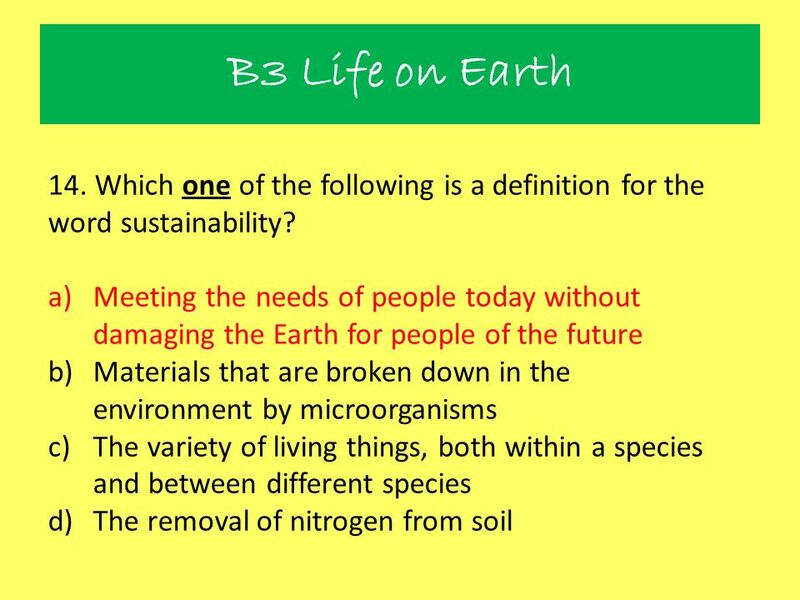 3 B3 Life on Earth 2. 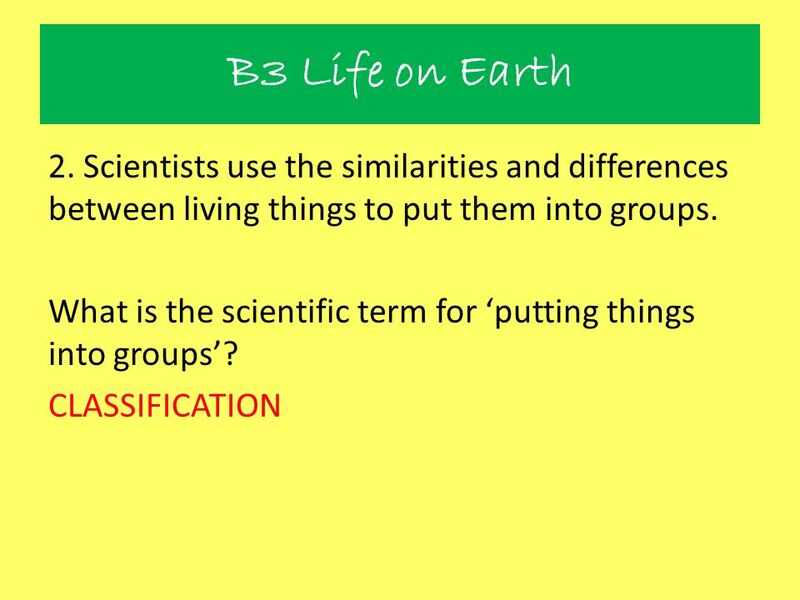 Scientists use the similarities and differences between living things to put them into groups. 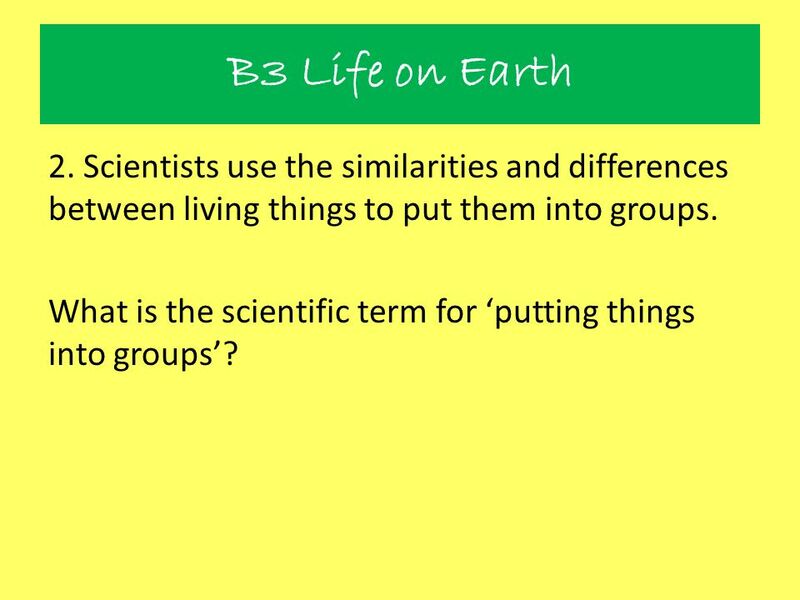 What is the scientific term for ‘putting things into groups’? 4 B3 Life on Earth 3. 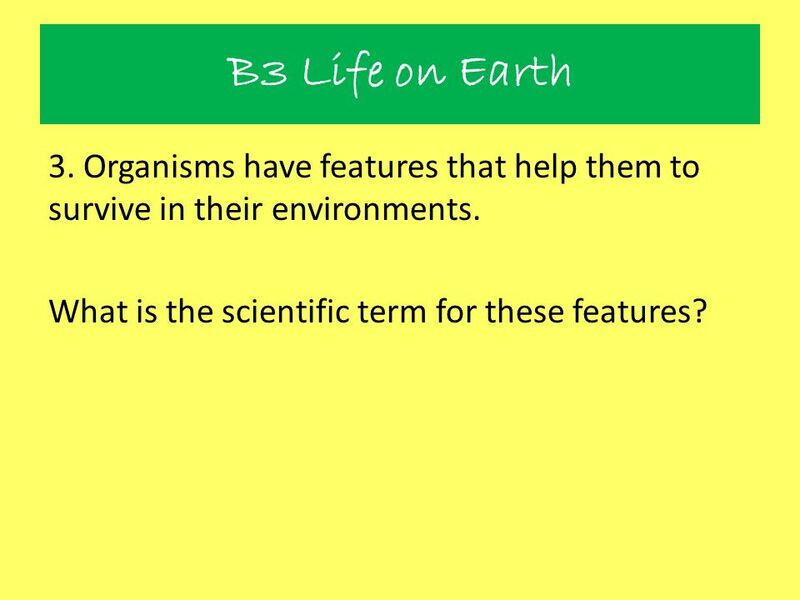 Organisms have features that help them to survive in their environments. What is the scientific term for these features? 5 B3 Life on Earth 4. 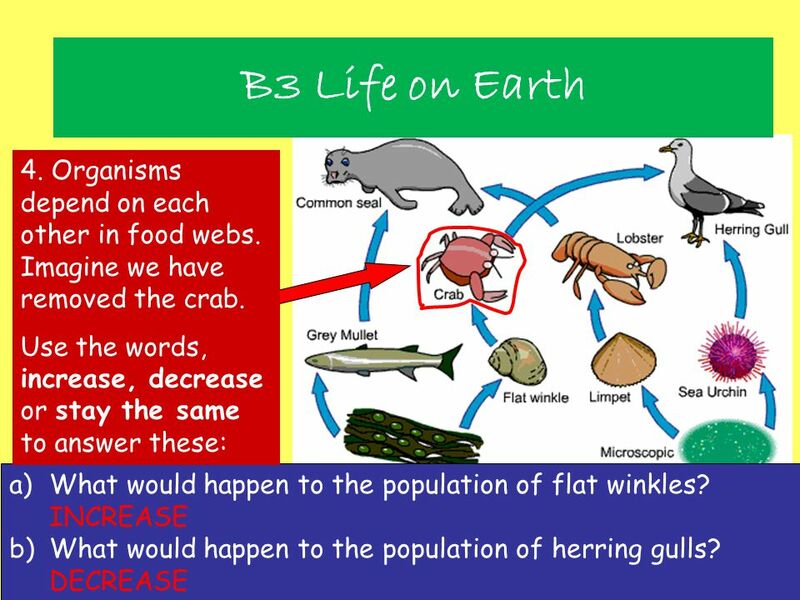 Organisms depend on each other in food webs. Imagine we have removed the crab. 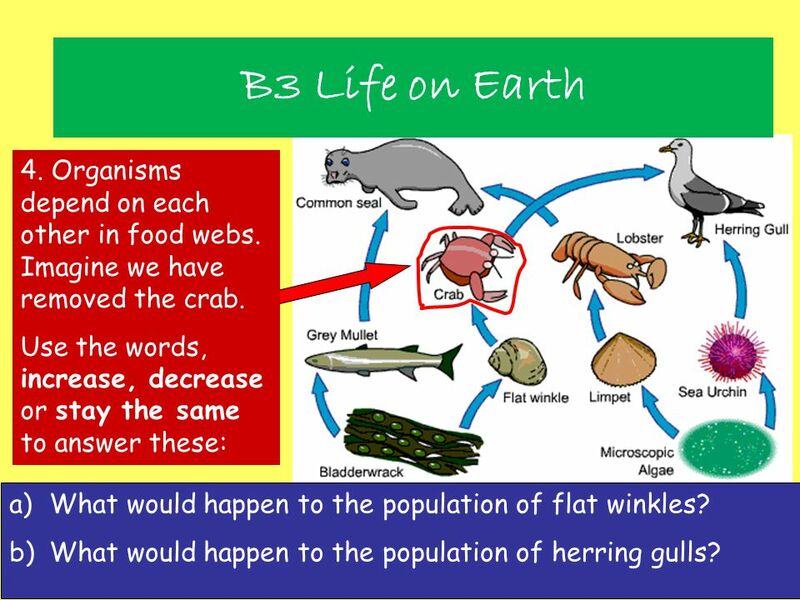 Use the words, increase, decrease or stay the same to answer these: What would happen to the population of flat winkles? What would happen to the population of herring gulls? 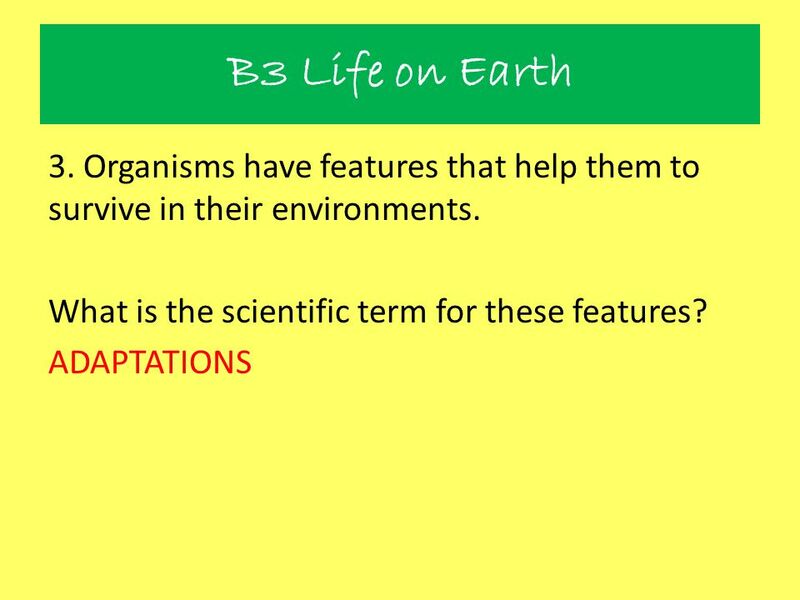 6 B3 Life on Earth 5. 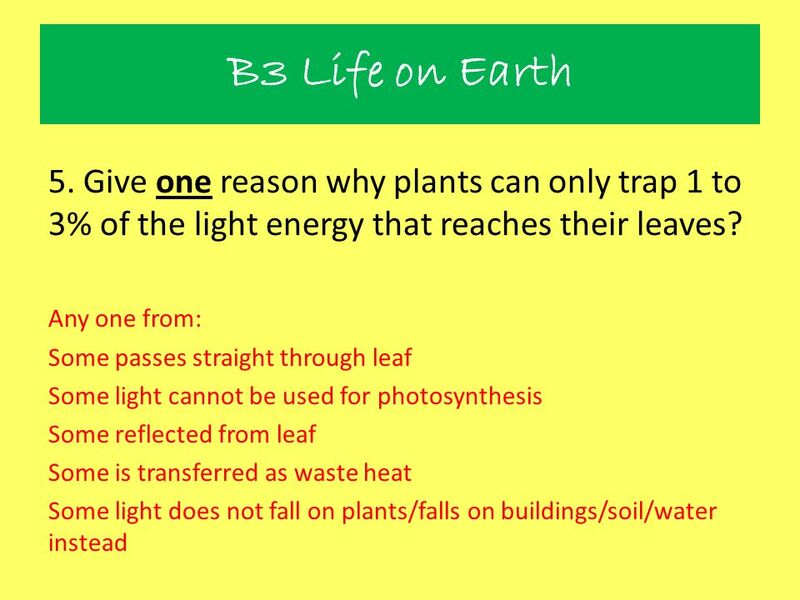 Give one reason why plants can only trap 1 to 3% of the light energy that reaches their leaves. 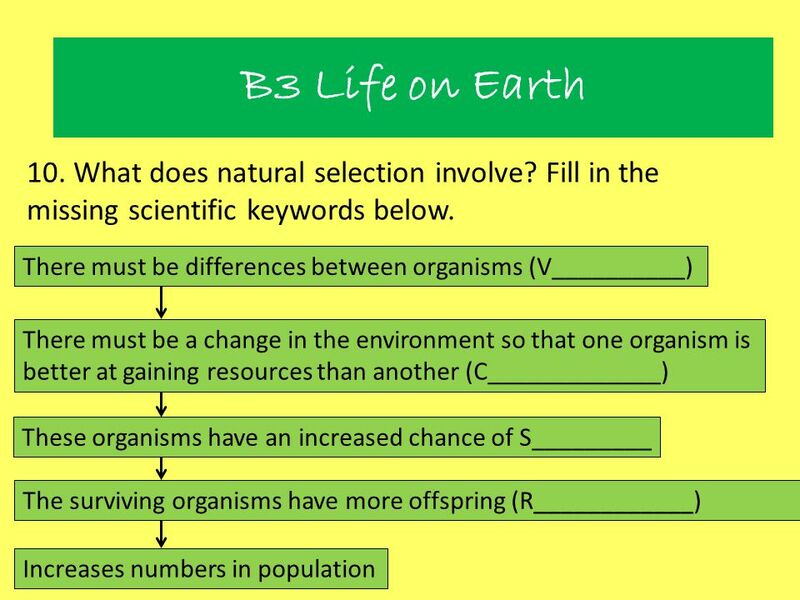 9 B3 Life on Earth 8. 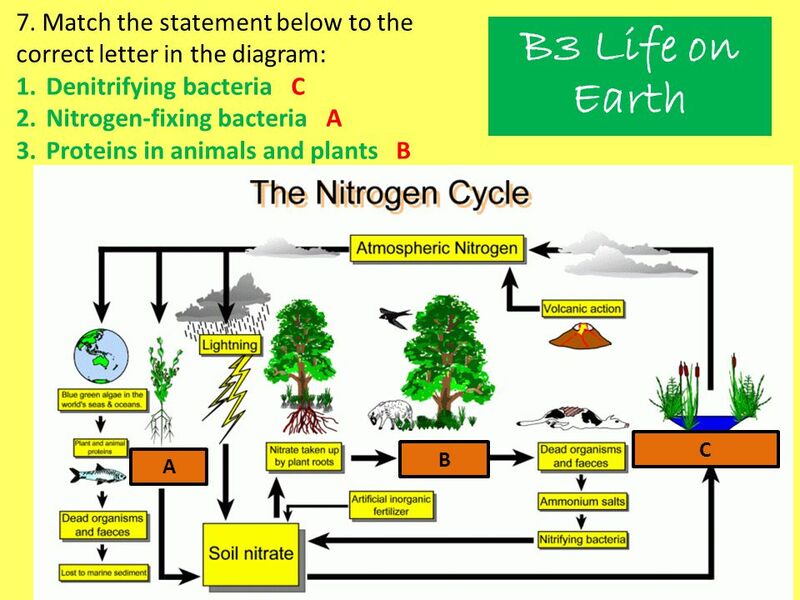 The carbon cycle is another important cycle that takes place in the environment. 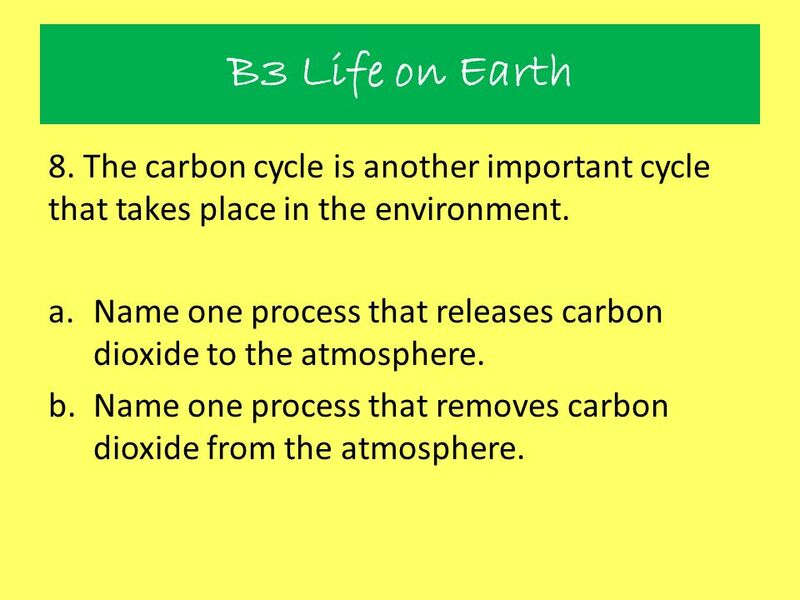 Name one process that releases carbon dioxide to the atmosphere. Name one process that removes carbon dioxide from the atmosphere. 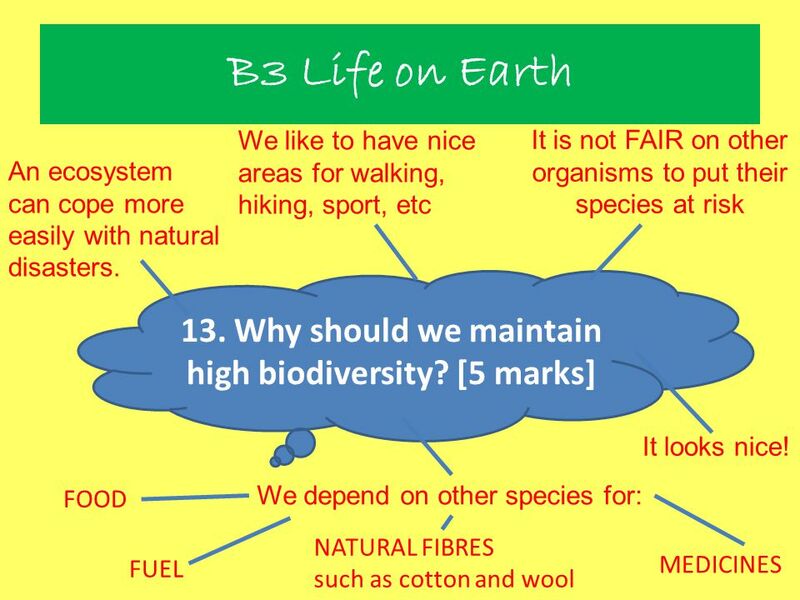 10 B3 Life on Earth 9. 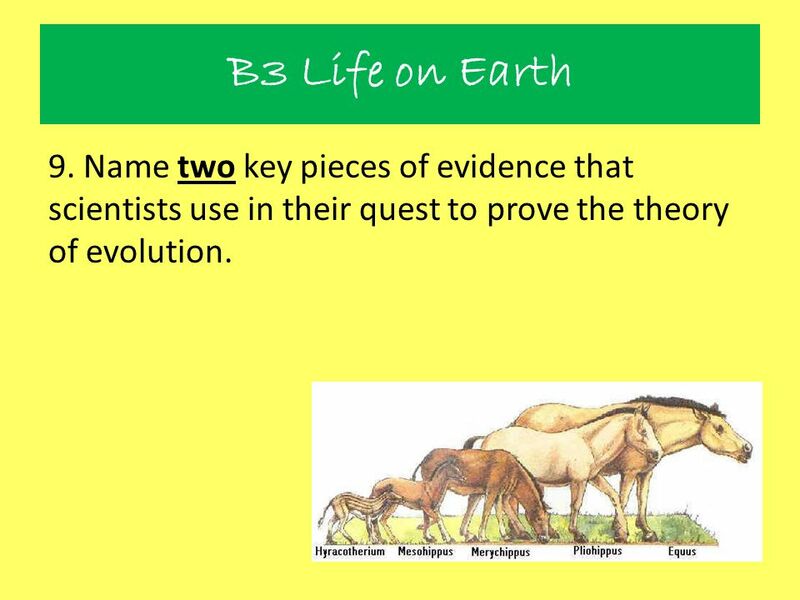 Name two key pieces of evidence that scientists use in their quest to prove the theory of evolution. 12 B3 Life on Earth 11. 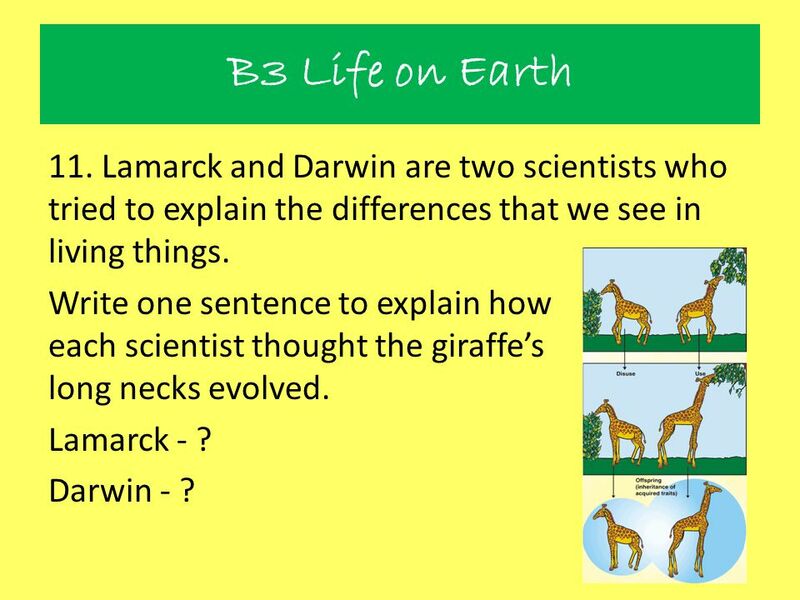 Lamarck and Darwin are two scientists who tried to explain the differences that we see in living things. Write one sentence to explain how each scientist thought the giraffe’s long necks evolved. Lamarck - ? Darwin - ? 13 B3 Life on Earth 12. 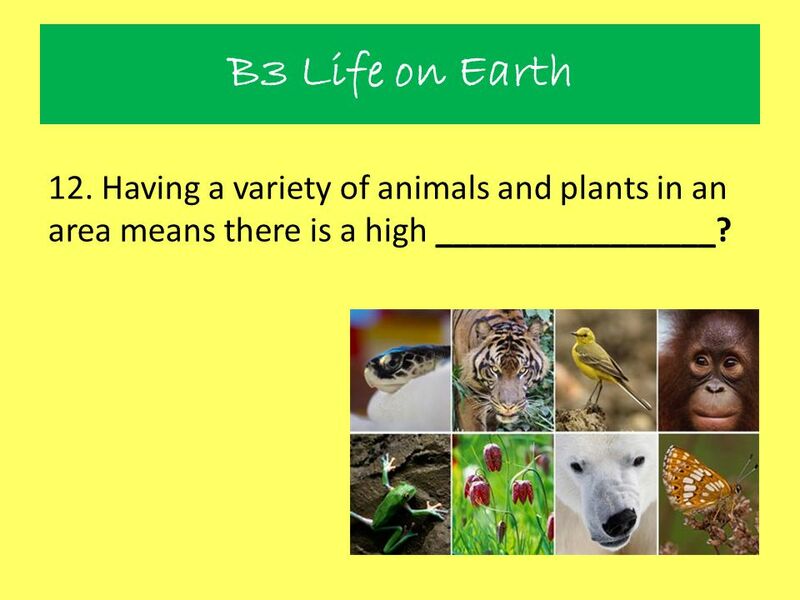 Having a variety of animals and plants in an area means there is a high ________________? 2. Fill in the gaps in this paragraph. 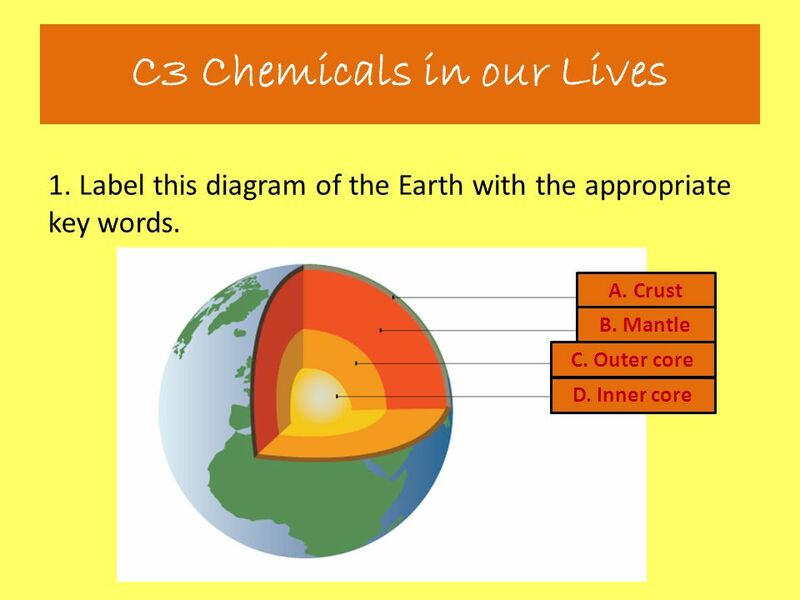 The Earth’s outer layers are divided into a number of ____A_____ plates. Each plate contains dense oceanic crust, often carrying some lighter continental crust on top of it. The plates move because of very slow _____B_______ currents in the underlying solid mantle. 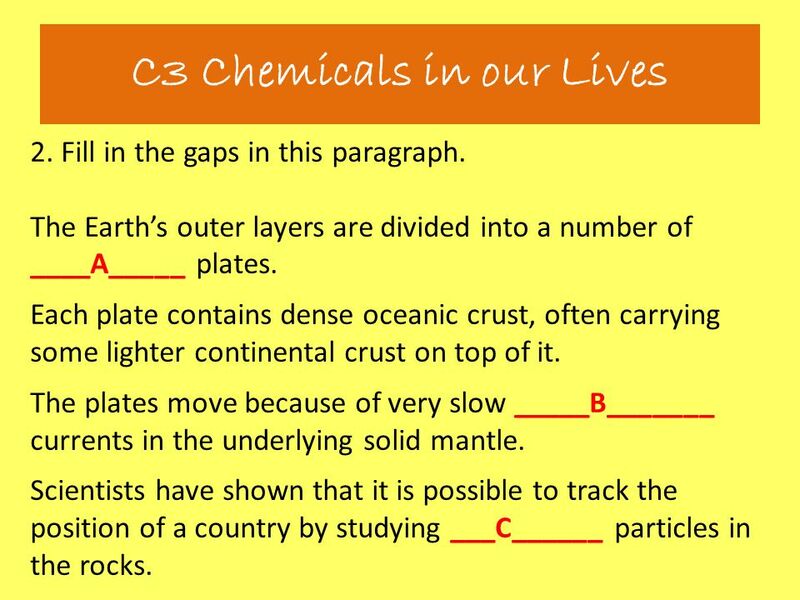 Scientists have shown that it is possible to track the position of a country by studying ___C______ particles in the rocks. 6. The following questions are about water treatment. Name one disease that can be transmitted through contaminated water. What chemical is now used to treat water to prevent water-borne disease? What does THM stand for? How do THMs form? Why are some people worried about the presence of THMs in water supplies? 8. 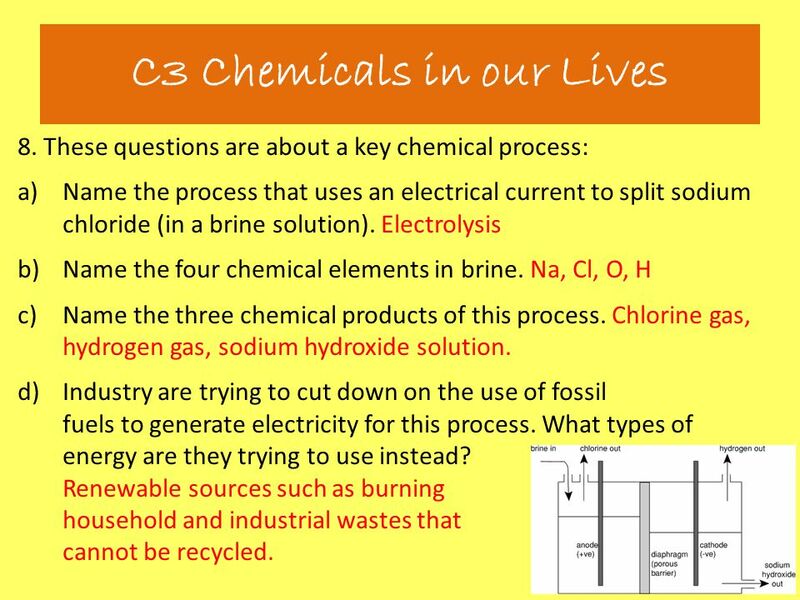 These questions are about a key chemical process: Name the process that uses an electrical current to split sodium chloride (in a brine solution) Name the four chemical elements in brine. 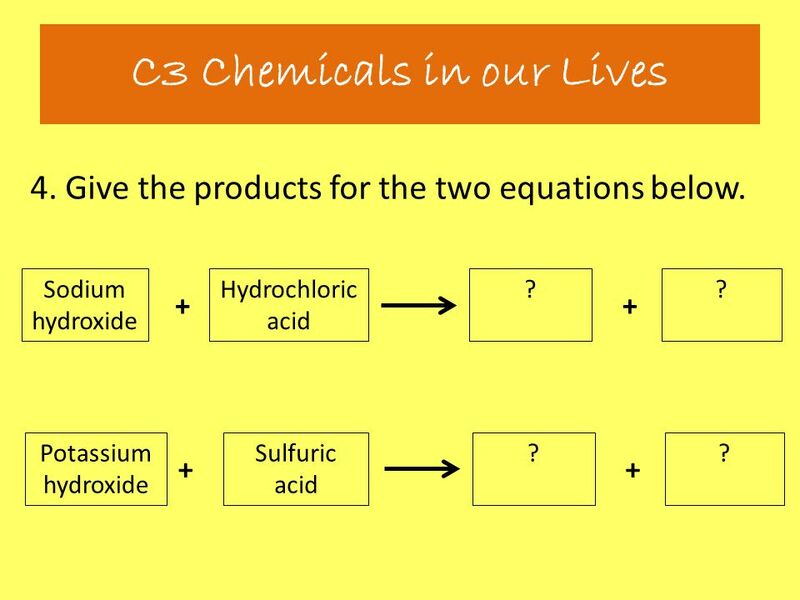 Name the three chemical products of this process. Industry are trying to cut down on the use of fossil fuels to generate electricity for this process. What types of energy are they trying to use instead? 9. 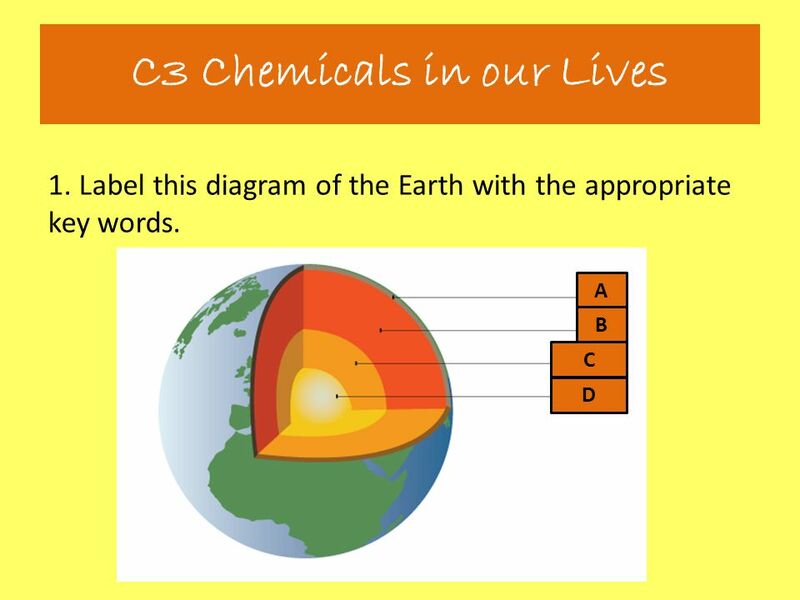 This question is about chemicals in the environment. What are POPs? Why are they a particular problem for people living in the Arctic? 10. This pipe is made from PVC. 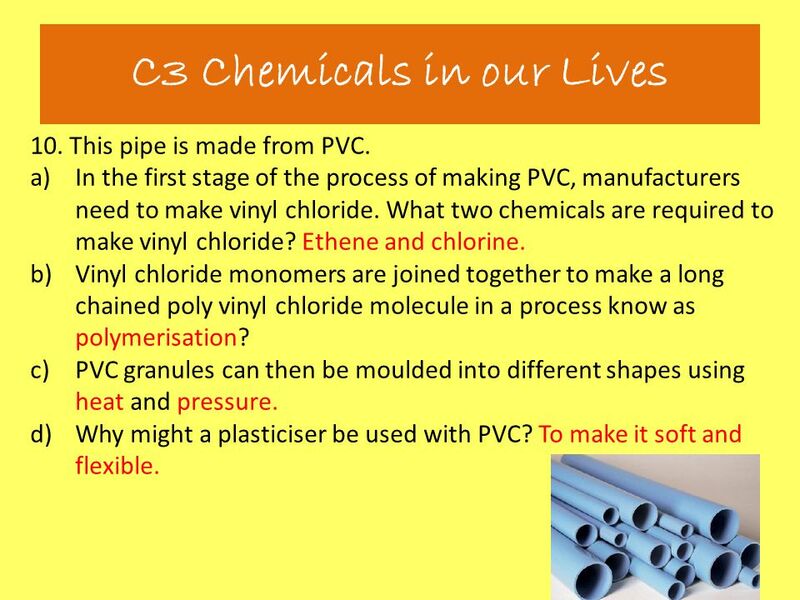 In the first stage of the process of making PVC, manufacturers need to make vinyl chloride. 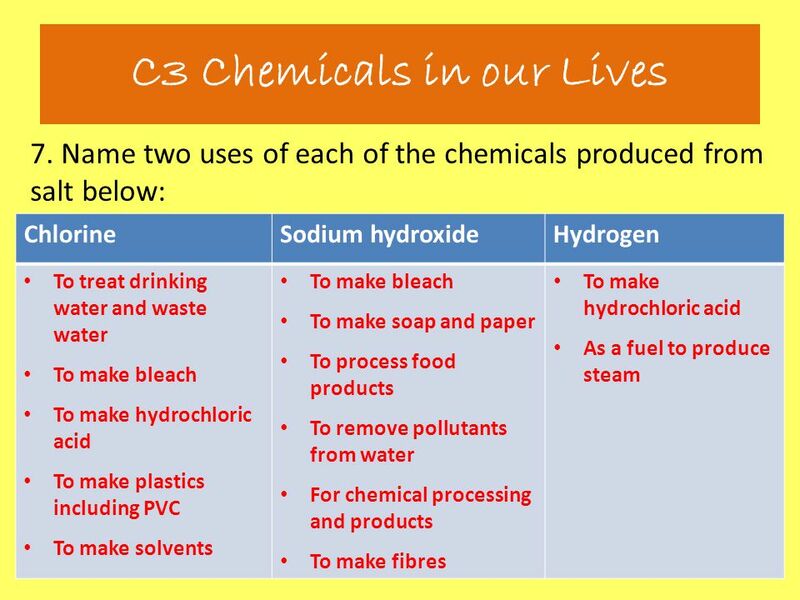 What two chemicals are required to make vinyl chloride? Vinyl chloride monomers are joined together to make a long chained poly vinyl chloride molecule in a process know as p_____________? PVC granules can then be moulded into different shapes using h______ and p_________. Why might a plasticiser be used with PVC? 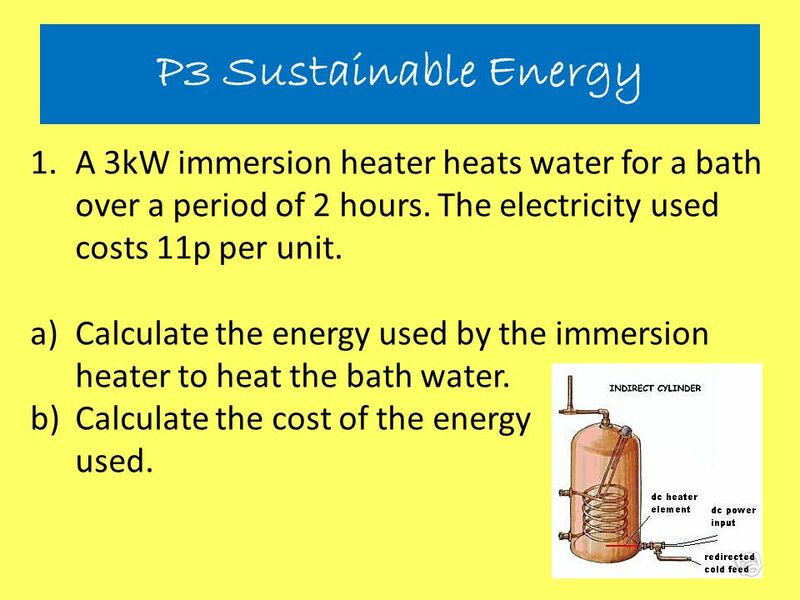 26 P3 Sustainable Energy A 3kW immersion heater heats water for a bath over a period of 2 hours. The electricity used costs 11p per unit. 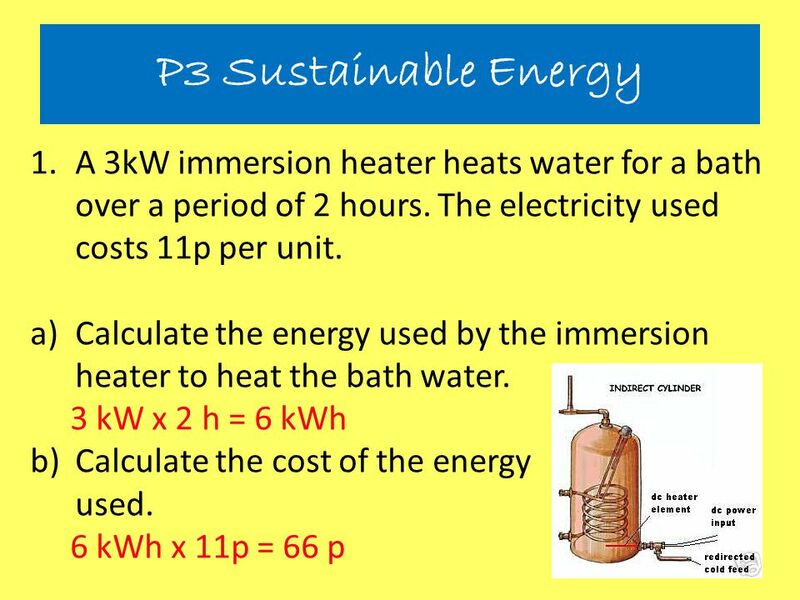 Calculate the energy used by the immersion heater to heat the bath water. Calculate the cost of the energy used. 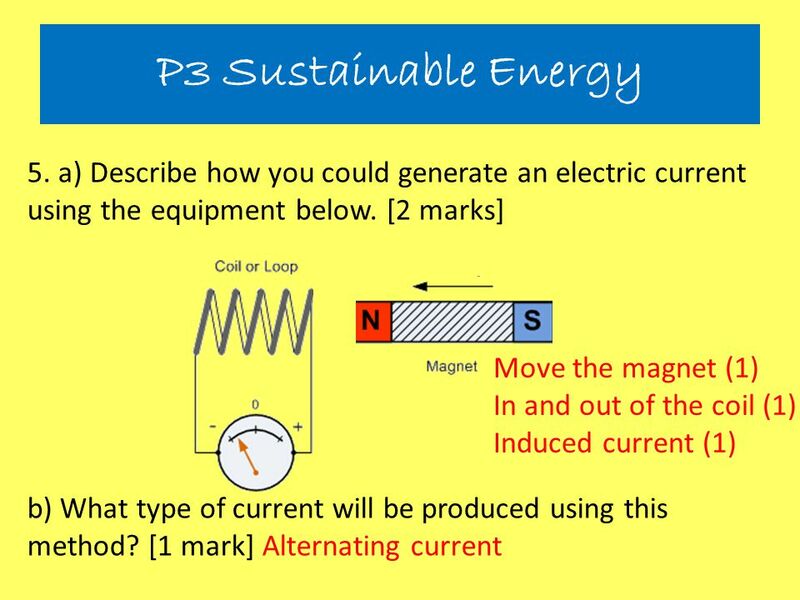 27 P3 Sustainable Energy 2. For all electrical items, their power is related to the current and the voltage of the electricity supply. 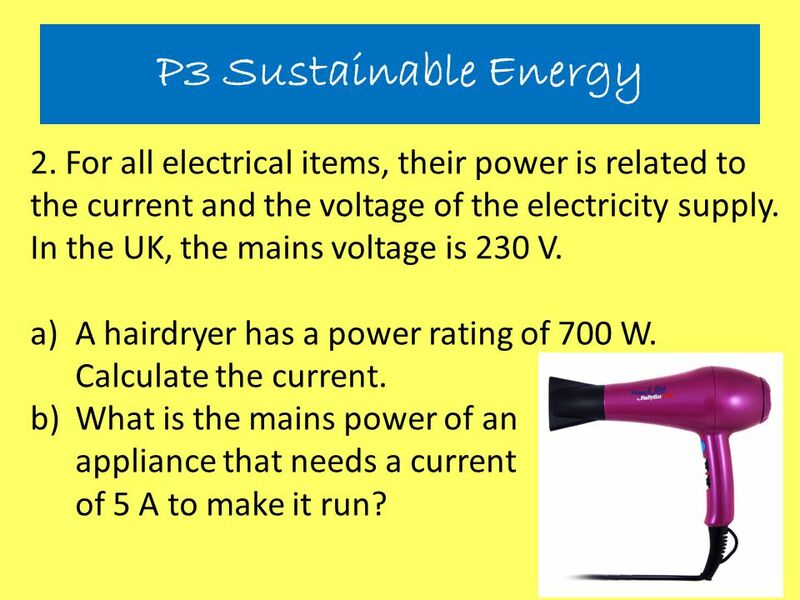 In the UK, the mains voltage is 230 V. A hairdryer has a power rating of 700 W. Calculate the current. 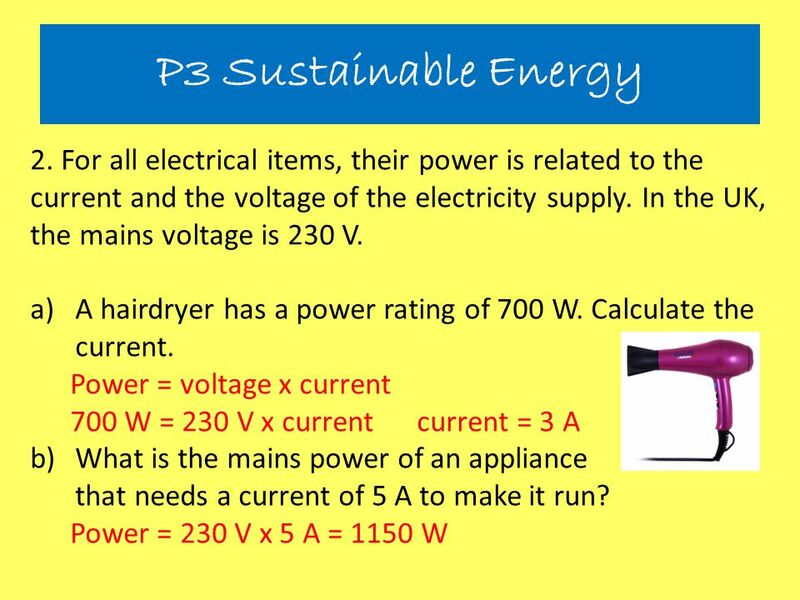 What is the mains power of an appliance that needs a current of 5 A to make it run? 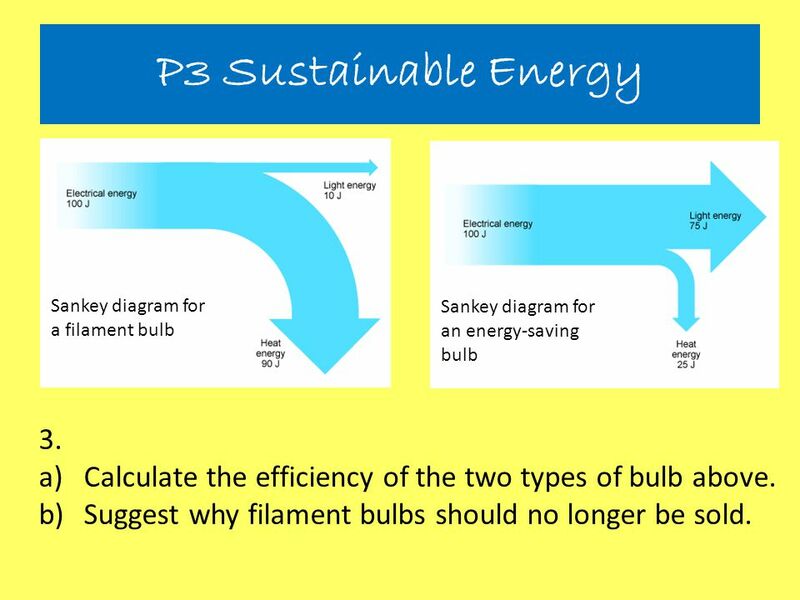 28 P3 Sustainable Energy Sankey diagram for a filament bulb Sankey diagram for an energy-saving bulb 3. Calculate the efficiency of the two types of bulb above. Suggest why filament bulbs should no longer be sold. 31 P3 Sustainable Energy 6. a) Use the words to label the numbered parts of this coal-fired power station. GENERATOR TURBINE FURNACE TRANSFORMER b) How would this power station be different if it was a nuclear power station? 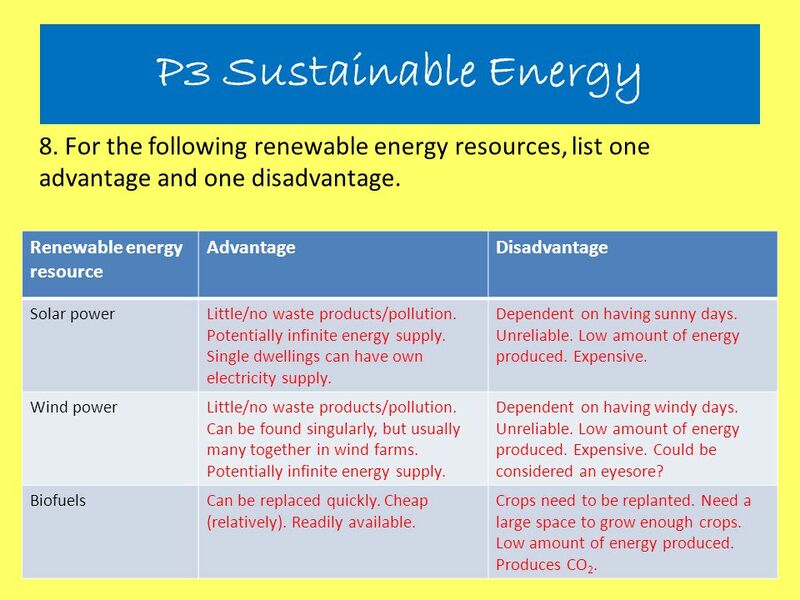 32 P3 Sustainable Energy 7. 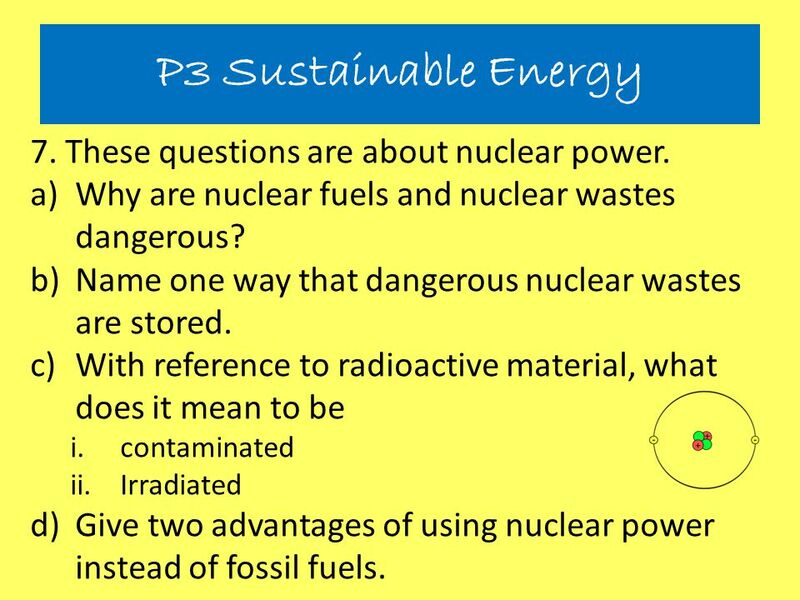 These questions are about nuclear power. Why are nuclear fuels and nuclear wastes dangerous? Name one way that dangerous nuclear wastes are stored. 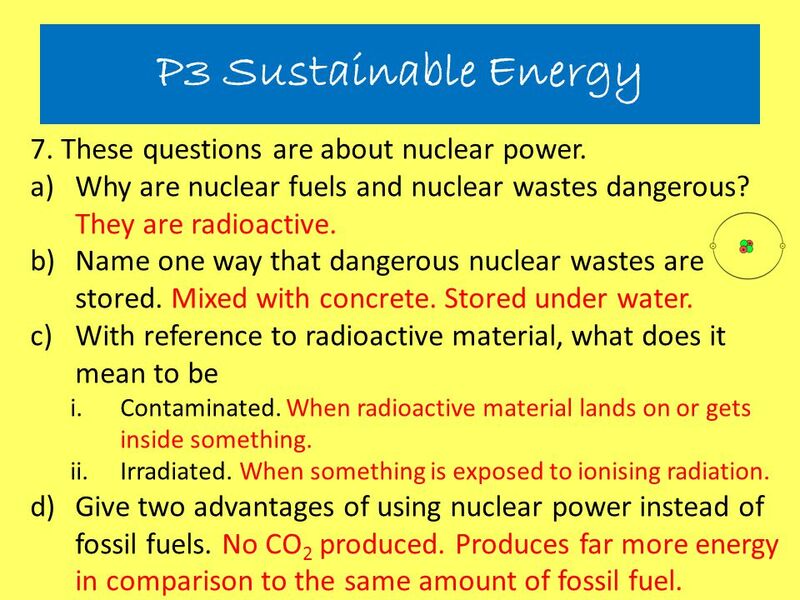 With reference to radioactive material, what does it mean to be contaminated Irradiated Give two advantages of using nuclear power instead of fossil fuels. 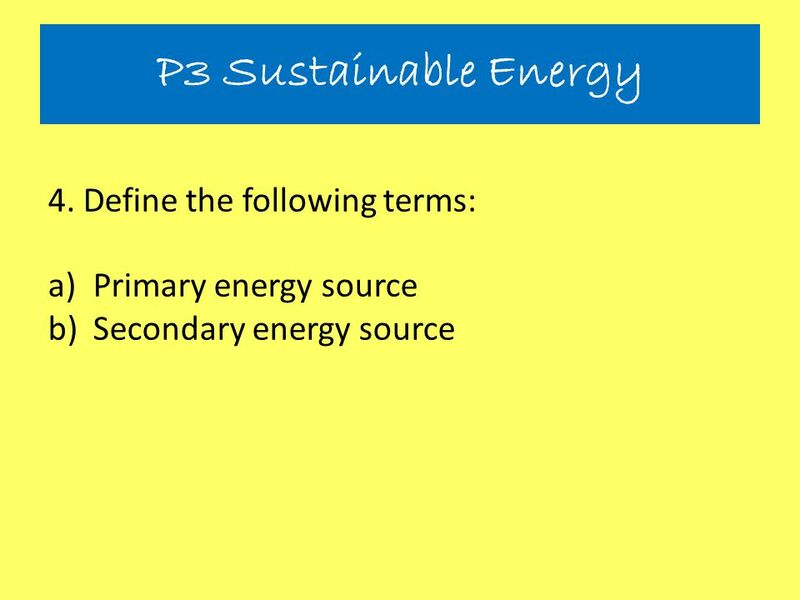 34 P3 Sustainable Energy 9. The following questions are about the National Grid. 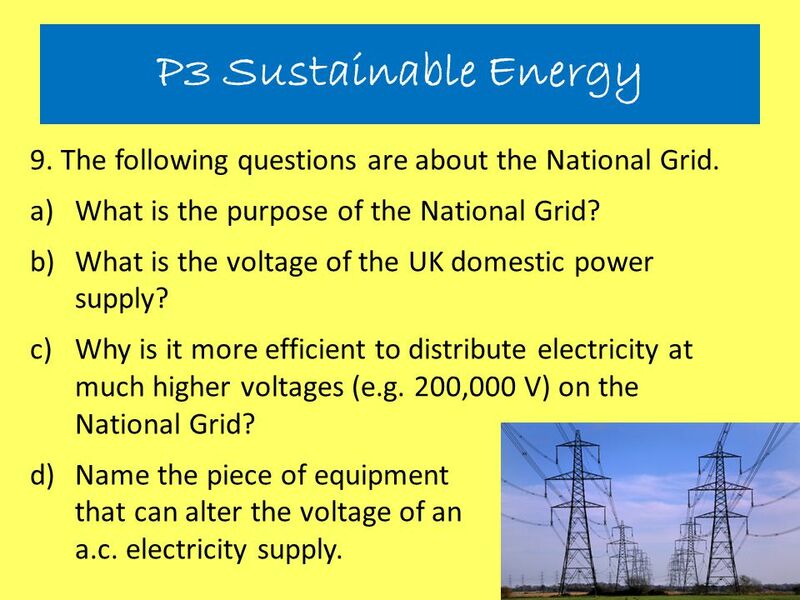 What is the purpose of the National Grid? What is the voltage of the UK domestic power supply? Why is it more efficient to distribute electricity at much higher voltages (e.g. 200,000 V) on the National Grid? Name the piece of equipment that can alter the voltage of an a.c. electricity supply. 47 B3 Life on Earth 11. 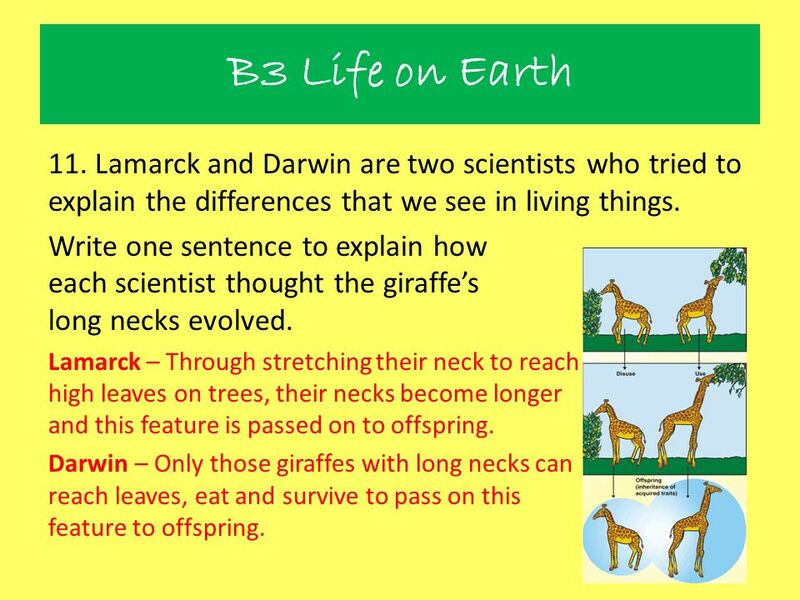 Lamarck and Darwin are two scientists who tried to explain the differences that we see in living things. Write one sentence to explain how each scientist thought the giraffe’s long necks evolved. Lamarck – Through stretching their neck to reach high leaves on trees, their necks become longer and this feature is passed on to offspring. Darwin – Only those giraffes with long necks can reach leaves, eat and survive to pass on this feature to offspring. 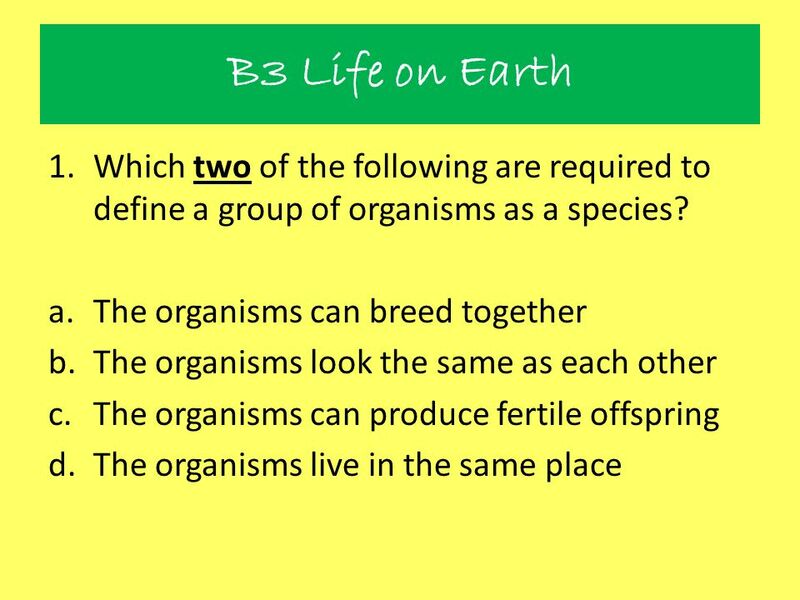 48 B3 Life on Earth 12. Having a variety of animals and plants in an area means there is a high BIODIVERSITY? 2. Fill in the gaps in this paragraph. The Earth’s outer layers are divided into a number of tectonic plates. Each plate contains dense oceanic crust, often carrying some lighter continental crust on top of it. 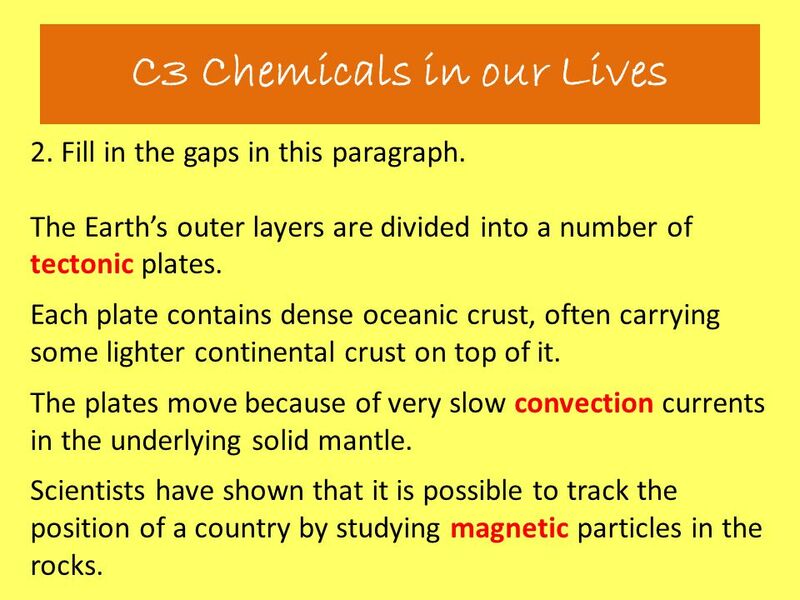 The plates move because of very slow convection currents in the underlying solid mantle. Scientists have shown that it is possible to track the position of a country by studying magnetic particles in the rocks. 3. 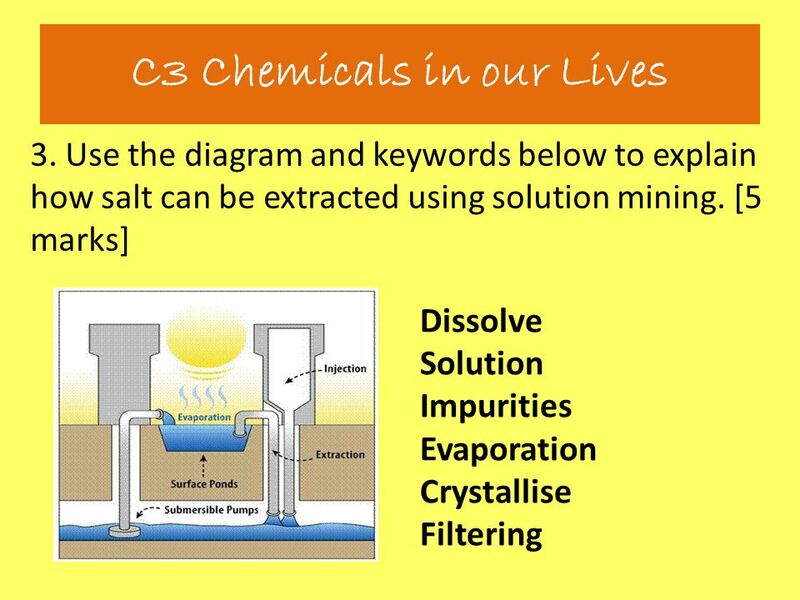 Use the diagram and keywords below to explain how salt can be extracted using solution mining. 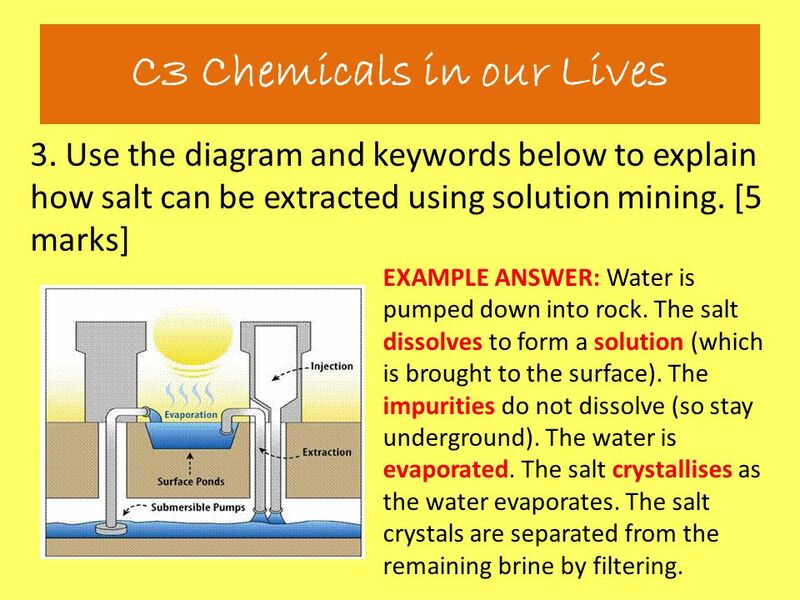 [5 marks] EXAMPLE ANSWER: Water is pumped down into rock. The salt dissolves to form a solution (which is brought to the surface). The impurities do not dissolve (so stay underground). The water is evaporated. The salt crystallises as the water evaporates. The salt crystals are separated from the remaining brine by filtering. 6. The following questions are about water treatment. Name one disease that can be transmitted through contaminated water. Cholera, typhoid, dysentry, gastroenteritis. 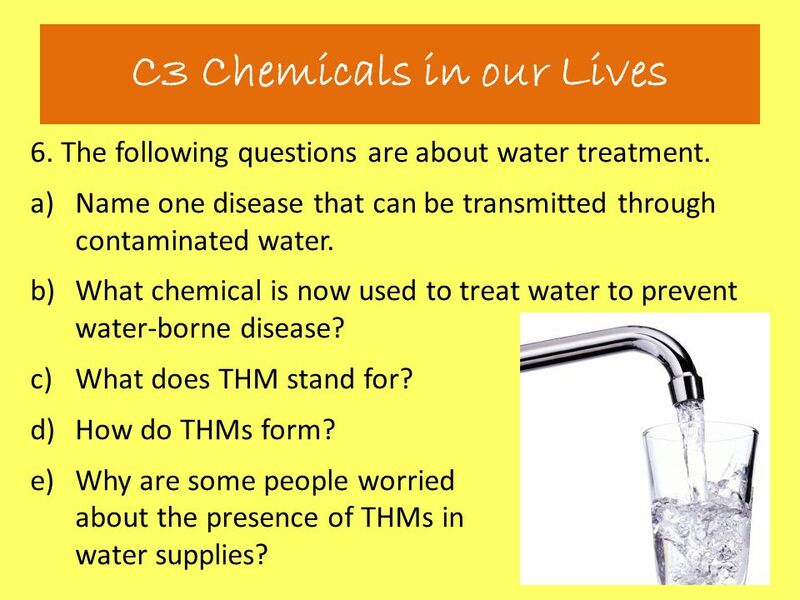 What chemical is now used to treat water to prevent water-borne disease? 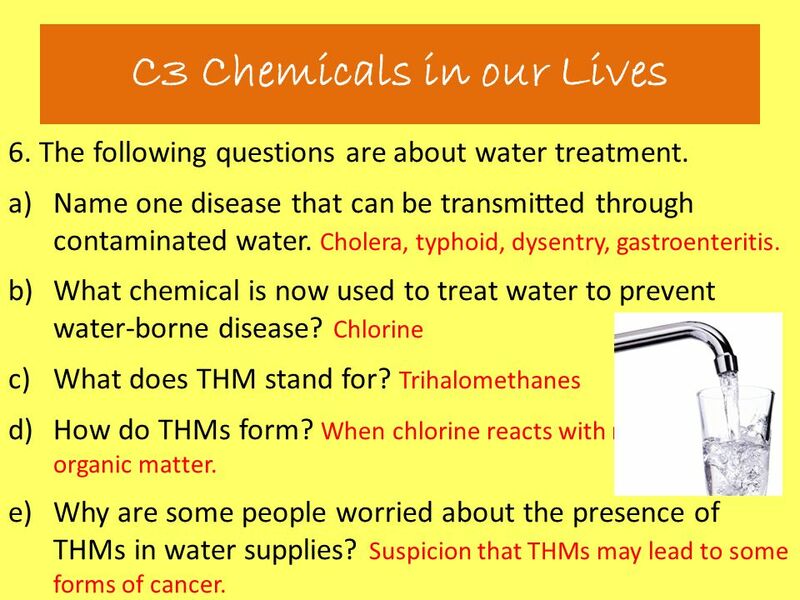 Chlorine What does THM stand for? Trihalomethanes How do THMs form? When chlorine reacts with naturally found organic matter. Why are some people worried about the presence of THMs in water supplies? Suspicion that THMs may lead to some forms of cancer. 8. 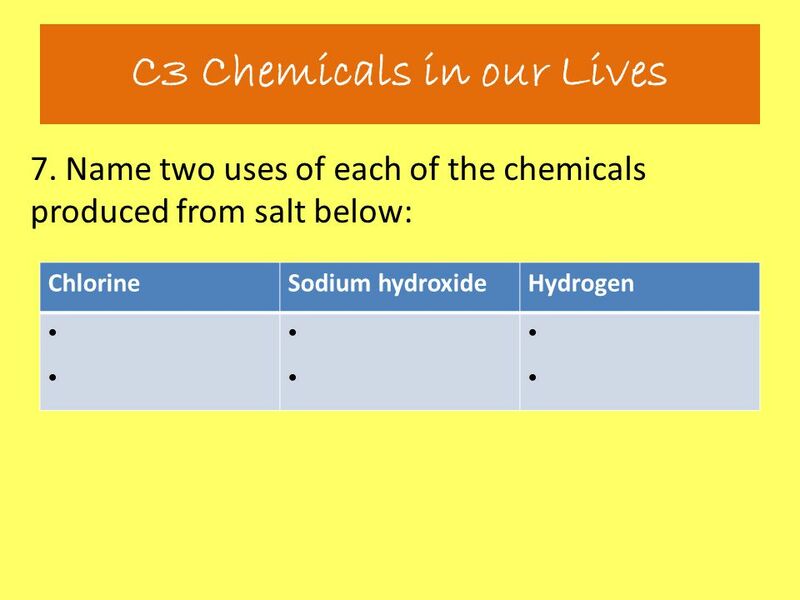 These questions are about a key chemical process: Name the process that uses an electrical current to split sodium chloride (in a brine solution). 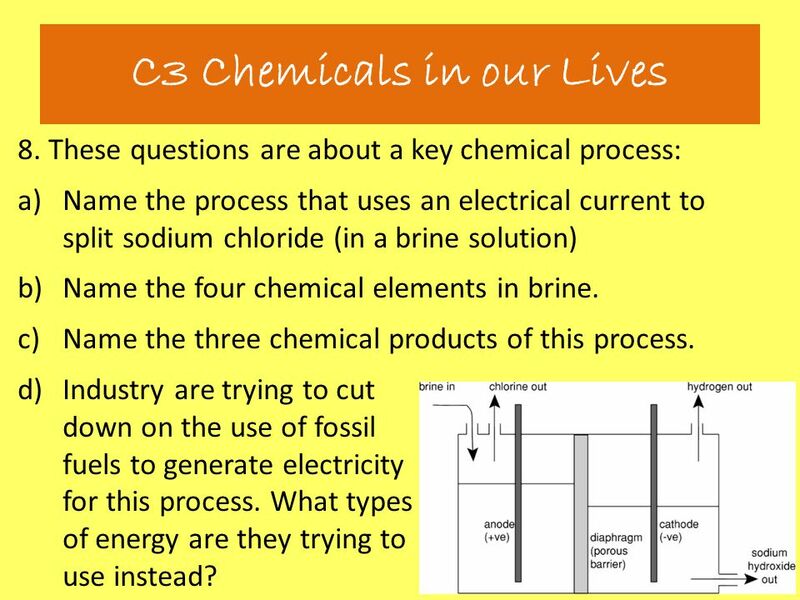 Electrolysis Name the four chemical elements in brine. 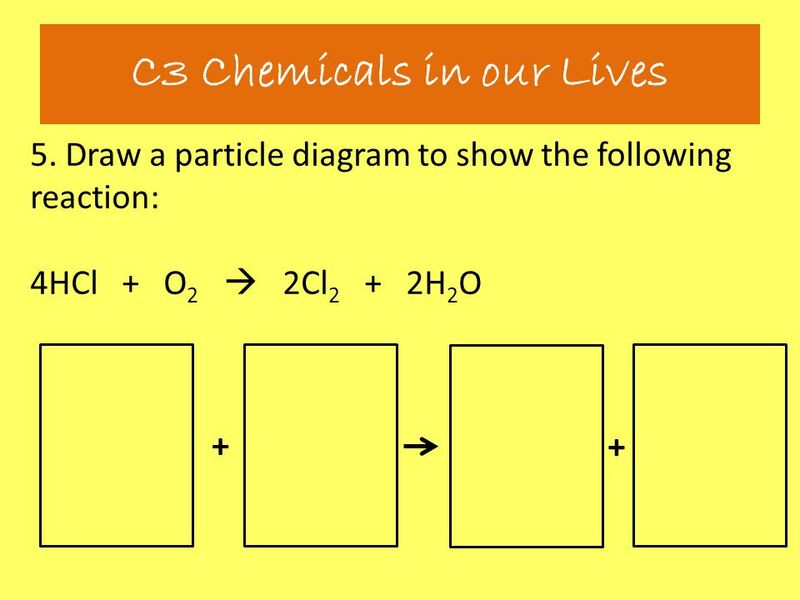 Na, Cl, O, H Name the three chemical products of this process. Chlorine gas, hydrogen gas, sodium hydroxide solution. Industry are trying to cut down on the use of fossil fuels to generate electricity for this process. What types of energy are they trying to use instead? Renewable sources such as burning household and industrial wastes that cannot be recycled. 9. 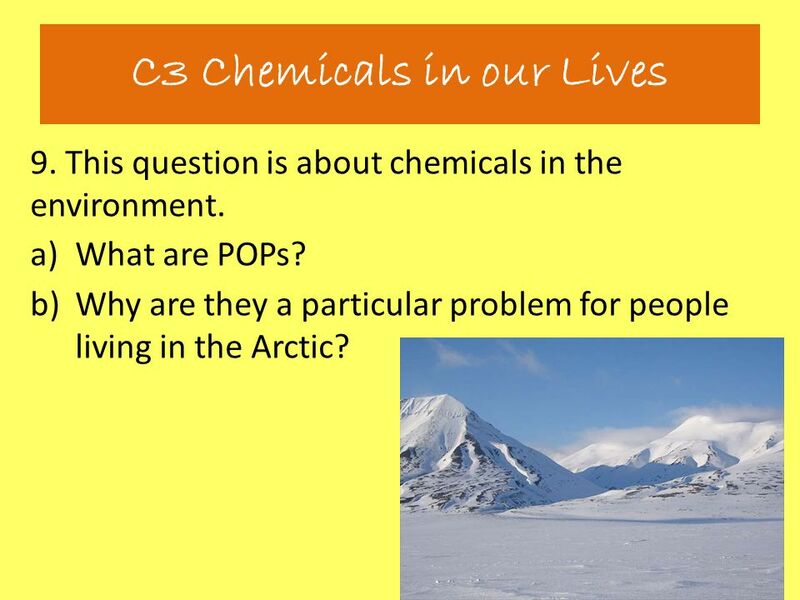 This question is about chemicals in the environment. What are POPs? Persistent organic pollutants. Why are they a particular problem for people living in the Arctic? POPs tend to accumulate in fatty tissue of animals. 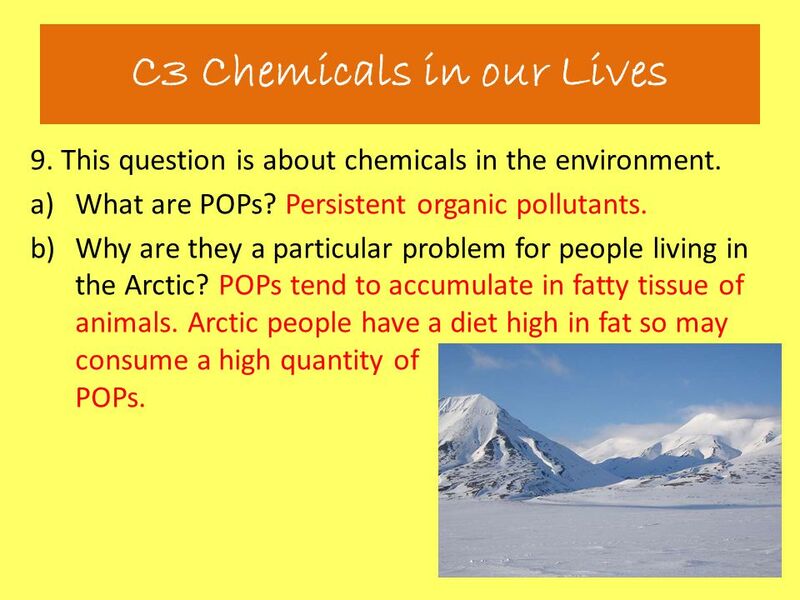 Arctic people have a diet high in fat so may consume a high quantity of POPs. 10. This pipe is made from PVC. 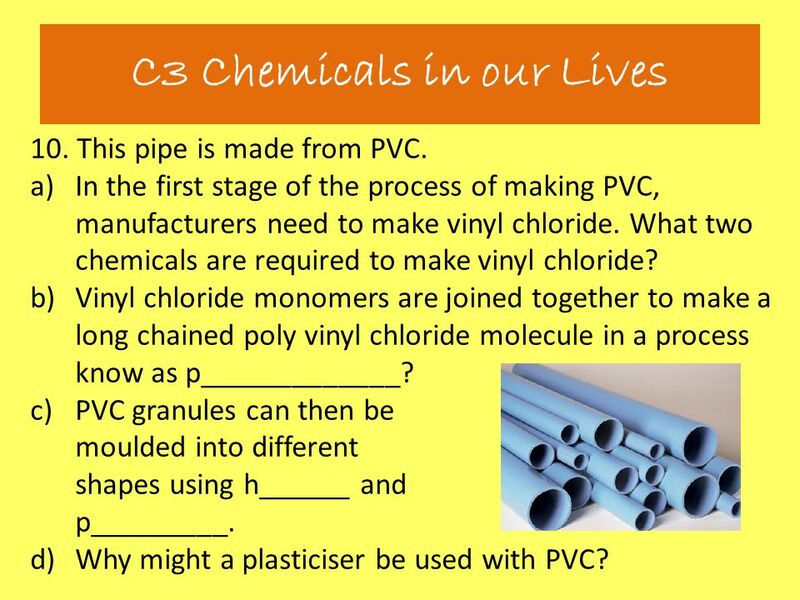 In the first stage of the process of making PVC, manufacturers need to make vinyl chloride. 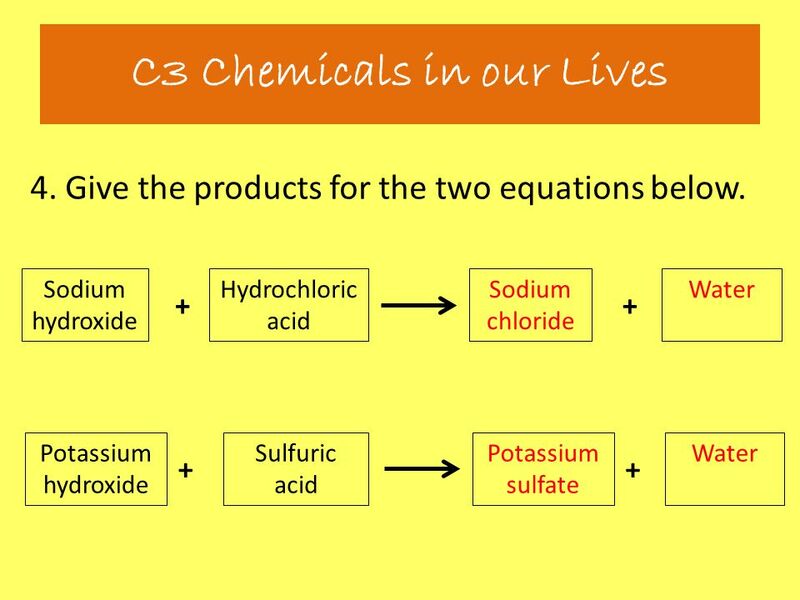 What two chemicals are required to make vinyl chloride? Ethene and chlorine. Vinyl chloride monomers are joined together to make a long chained poly vinyl chloride molecule in a process know as polymerisation? PVC granules can then be moulded into different shapes using heat and pressure. Why might a plasticiser be used with PVC? To make it soft and flexible. 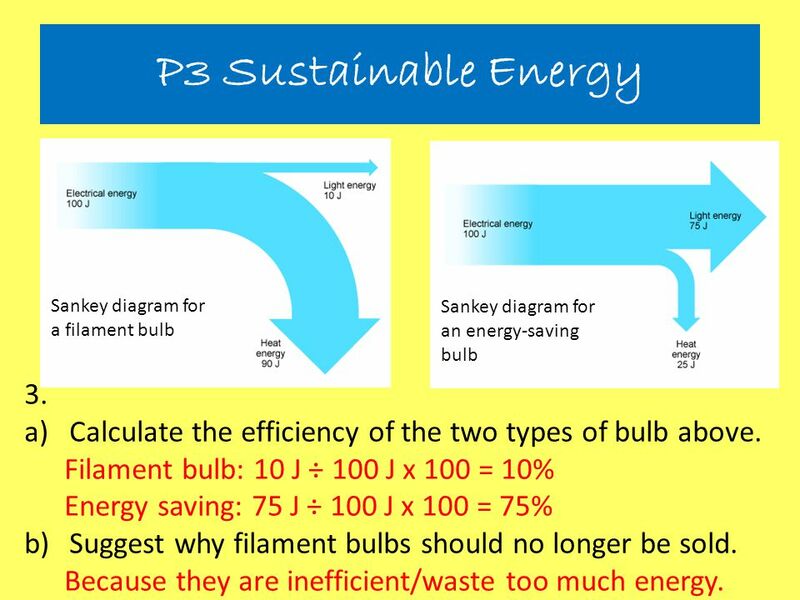 63 P3 Sustainable Energy Sankey diagram for a filament bulb Sankey diagram for an energy-saving bulb 3. Calculate the efficiency of the two types of bulb above. Filament bulb: 10 J ÷ 100 J x 100 = 10% Energy saving: 75 J ÷ 100 J x 100 = 75% Suggest why filament bulbs should no longer be sold. Because they are inefficient/waste too much energy. Primary energy source. 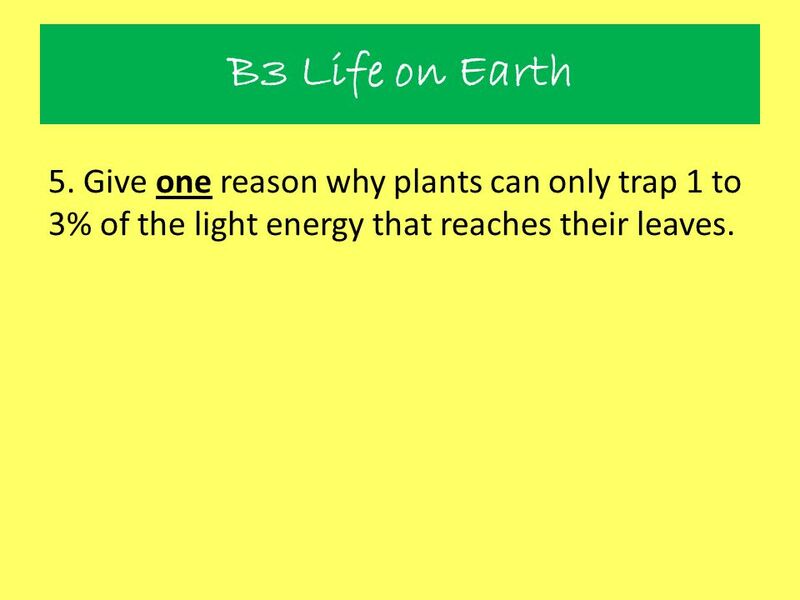 An energy source that occurs naturally e.g. coal, oil, natural gas, wind, sunlight, wood. Secondary energy source. 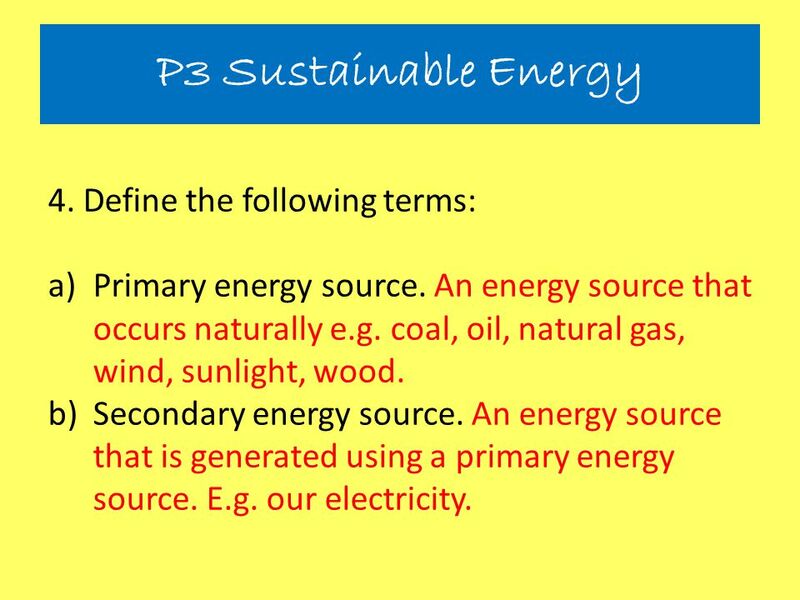 An energy source that is generated using a primary energy source. E.g. our electricity. 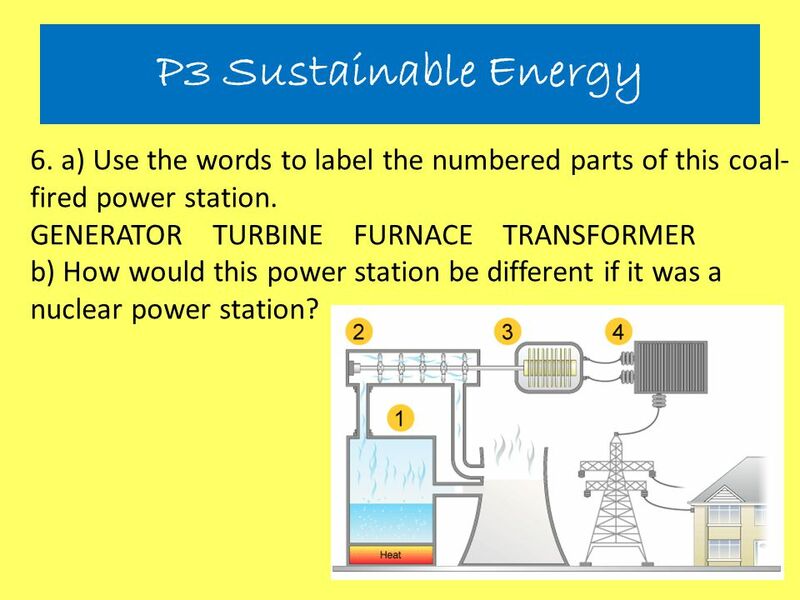 66 P3 Sustainable Energy 6. a) Use the words to label the numbered parts of this coal-fired power station. GENERATOR=3 TURBINE=2 FURNACE=1 TRANSFORMER=4 b) How would this power station be different if it was a nuclear power station? The furnace would not be present. Instead there would be a nuclear reactor. 67 P3 Sustainable Energy 7. These questions are about nuclear power. Why are nuclear fuels and nuclear wastes dangerous? They are radioactive. Name one way that dangerous nuclear wastes are stored. Mixed with concrete. Stored under water. With reference to radioactive material, what does it mean to be Contaminated. When radioactive material lands on or gets inside something. Irradiated. When something is exposed to ionising radiation. Give two advantages of using nuclear power instead of fossil fuels. No CO2 produced. Produces far more energy in comparison to the same amount of fossil fuel. 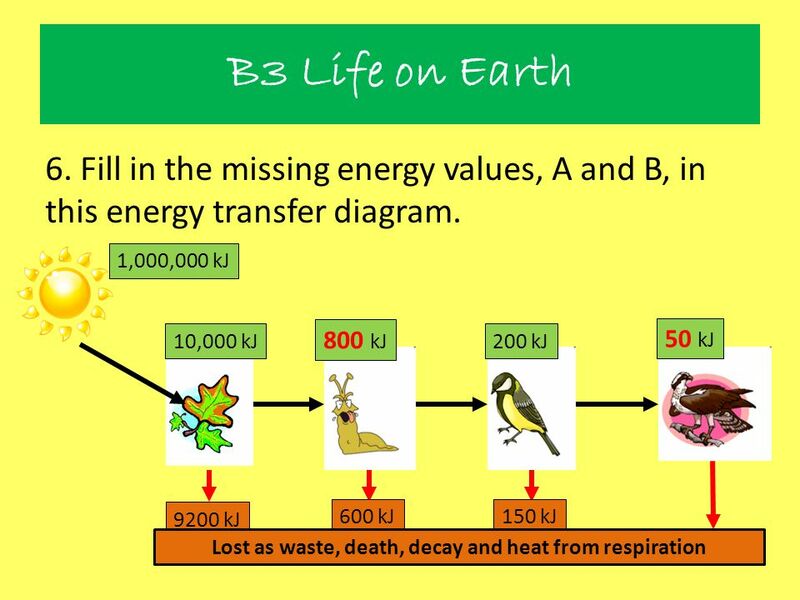 68 P3 Sustainable Energy 8. For the following renewable energy resources, list one advantage and one disadvantage. Renewable energy resource Advantage Disadvantage Solar power Little/no waste products/pollution. Potentially infinite energy supply. Single dwellings can have own electricity supply. Dependent on having sunny days. Unreliable. Low amount of energy produced. Expensive. Wind power Little/no waste products/pollution. Can be found singularly, but usually many together in wind farms. Potentially infinite energy supply. Dependent on having windy days. Unreliable. Low amount of energy produced. Expensive. Could be considered an eyesore? Biofuels Can be replaced quickly. Cheap (relatively). Readily available. Crops need to be replanted. Need a large space to grow enough crops. Low amount of energy produced. 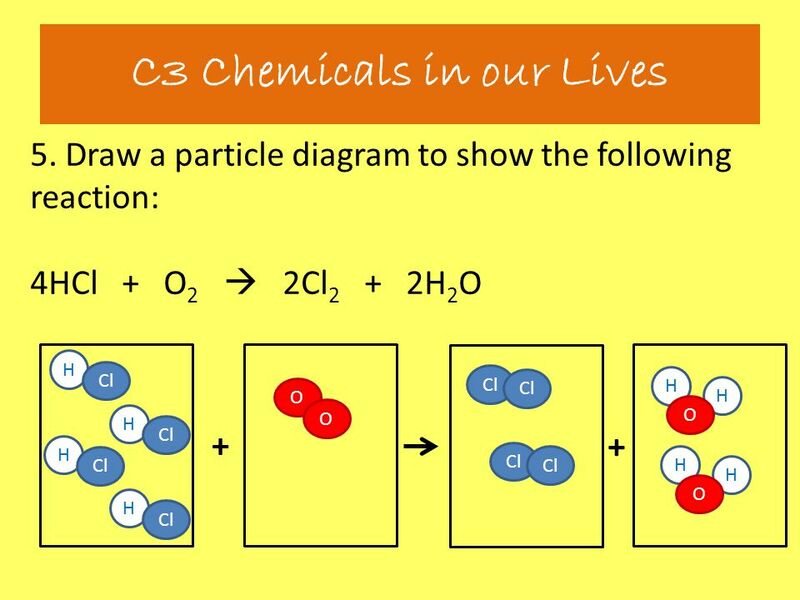 Produces CO2. 69 P3 Sustainable Energy 9. The following questions are about the National Grid. 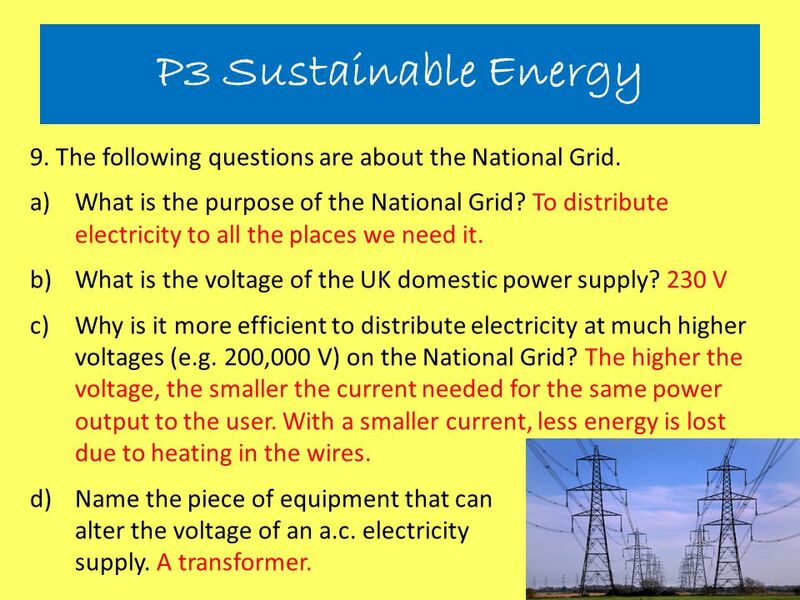 What is the purpose of the National Grid? To distribute electricity to all the places we need it. What is the voltage of the UK domestic power supply? 230 V Why is it more efficient to distribute electricity at much higher voltages (e.g. 200,000 V) on the National Grid? The higher the voltage, the smaller the current needed for the same power output to the user. With a smaller current, less energy is lost due to heating in the wires. Name the piece of equipment that can alter the voltage of an a.c. electricity supply. A transformer. 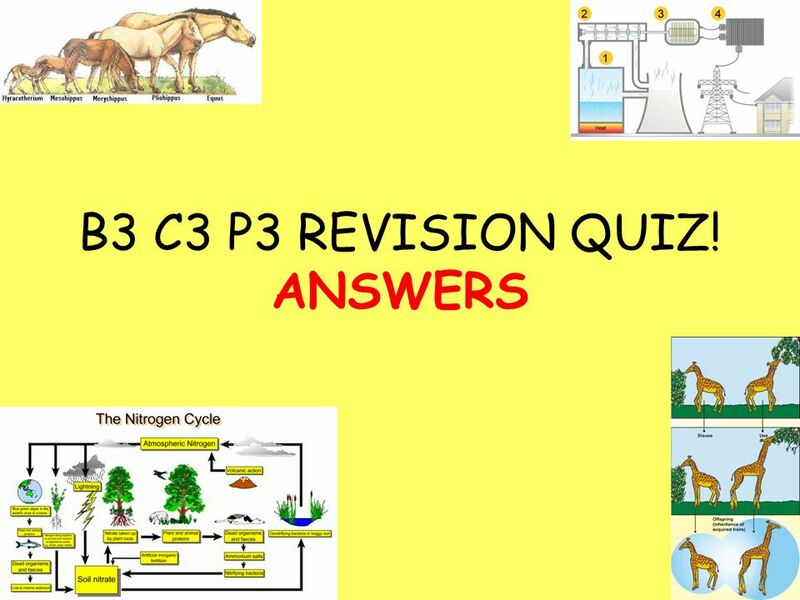 Download ppt "B3 C3 P3 REVISION QUIZ!." Look at the pictures and come up with what we will be studying for the first part of the lesson. 1. 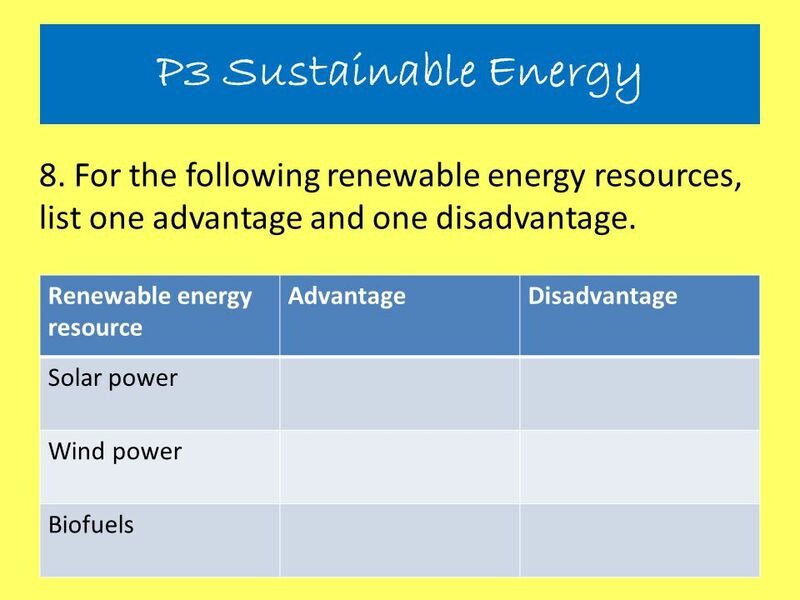 What are the advantages and disadvantages of renewable. Bottom-up control: Resource supply determines trophic structure. Bottom-up control is the influence of producers on the sizes of the trophic levels above. 1. Clues in rocks Geologists look for clues in rocks. They study them to see how the Earth’s surface has changed. They look at how the rocks have formed. 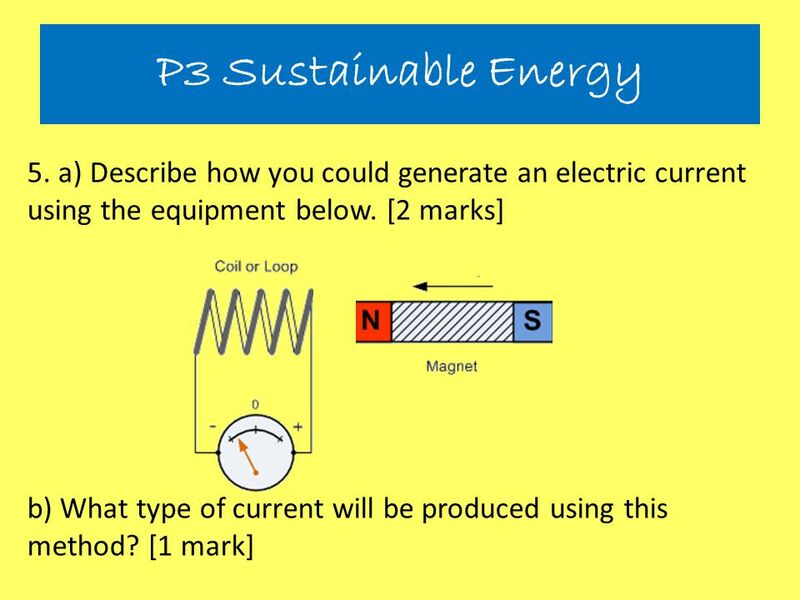 TODAY – starting P3 LO: Describe some different types of renewable energy [C] Know how energy is generated in power stations [B] STARTER List as many renewable. ECOSYSTEMS AND CYCLES EVERYTHING IS CONNECTED Ecology is the study of the interactions between living things and their environment –Living things are. HW: Due Wednesday! (20 pts) Test Thursday!. 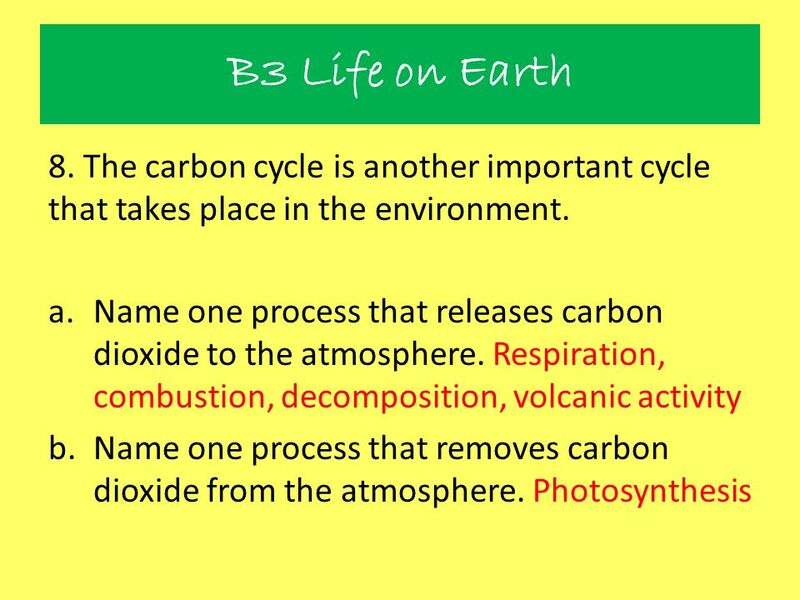 Assignments for Review Cycles of Matter Carbon Cycle & Climate Change Renewable and Nonrenewable Resources.